This article is about the voice actor. For the Futurama character, see Frank Welker's head. 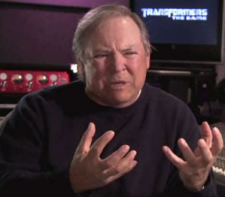 Franklin Wendell "Frank" Welker is an American actor who provides numerous voices on Futurama, including both the animalistic and speaking voices of Nibbler. He is famous as an actor for his ability to imitate (or invent) nearly every animal sound imaginable, and has done over 1,200 voices during his career. His longest running role is that of Freddie from Scooby-Doo, which he has played in most versions and even parodies and cameos. He also played some characters from Animaniacs, and has provided voices for the Transformers franchise, The Simpsons, the Star Trek franchise, the Star Wars franchise, Oswald the Lucky Rabbit and the Phantom Blot in Epic Mickey, and many more productions since the 1960s. Both Billy West and John DiMaggio have referred to him as a "voice acting god" in the commentaries. In "Lrrreconcilable Ndndifferences", he has a cameo as his head in a jar in the Head Museum. This page was last edited on 18 June 2017, at 18:44.